Sir Winston Churchill and his family lived at a beautiful country house called Chartwell in Kent in the South of England from 1922 until his death in 1965. Today Chartwell is owned by the National Trust and you can visit the house and its extensive grounds. It’s a lovely place to explore. I live near to Chartwell and have been there several times both with and without my children. Winston Churchill was a British Prime Minister who led the country to victory during World War II. He was also a prolific writer and a brilliant orator and he won the Nobel Prize for literature in 1953. Churchill died at Chartwell at the age of 90 on January 24th, 1965. I found Chartwell’s Death of a Hero exhibition about his death, funeral and legacy very interesting, especially as my parents have told me about their memories of his death and the huge impact which it had on people at the time. 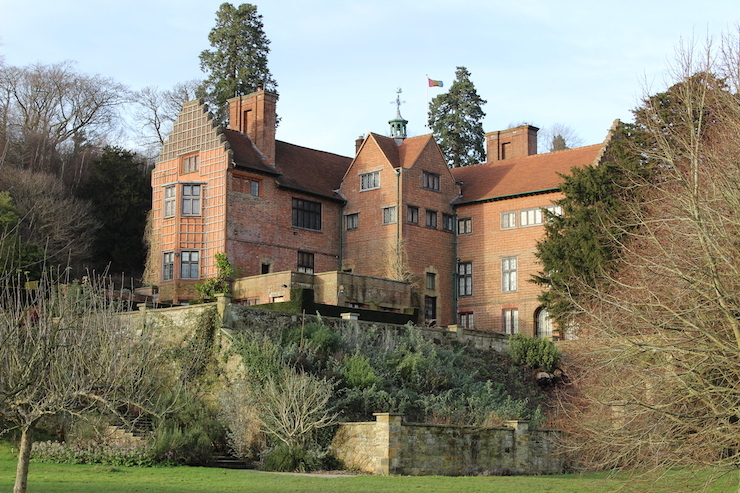 Winston Churchill and his wife Clementine had five children and Chartwell is presented today as the family home that it was when the children were growing up. Touring the house is fascinating and there are children’s trails to follow inside – but if you’re visiting with kids it’s the gardens and grounds which they’ll really enjoy. The 82-acre estate includes a 20-acre formal garden, lakes and woodland to explore and there are idyllic views across the Weald of Kent countryside. 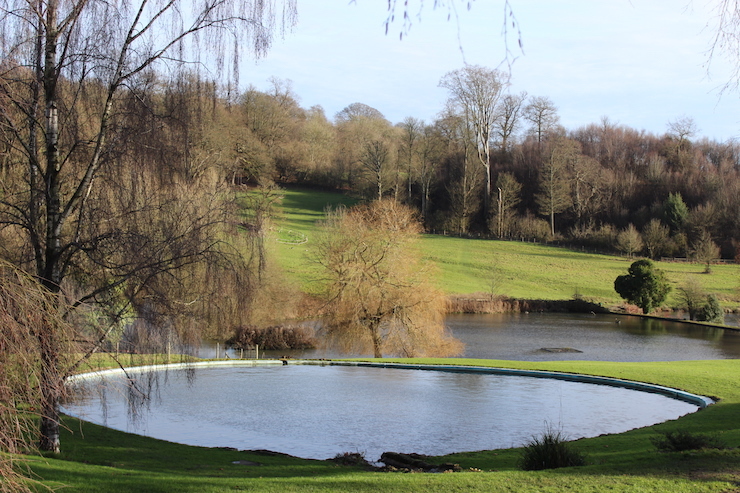 The gardens include a round, spring-fed pool which was heated for swimming when the Churchills lived at Chartwell. You can still see the fish pond where Churchill liked to sit and think and the family croquet lawn which used to be a tennis court. There are planted borders, a rock garden, a pavilion painted with murals and some tucked-away gravestones marking the area where the Churchill family pets are buried. Churchill was very interested in butterflies and wanted to encourage them in his garden. He bred a range of butterflies at Chartwell and today you can visit the small butterfly house there to learn about butterflies including how to raise your own at home. The wall around the kitchen garden was built by Churchill himself. Apparently he used to say that he could lay ‘200 bricks and 2000 words a day’. He also said that bricklaying helped him to cope with depression. The walled garden was used to grow fruit, vegetables and flowers for the family and their staff and visitors. This is my favourite part of Chartwell. 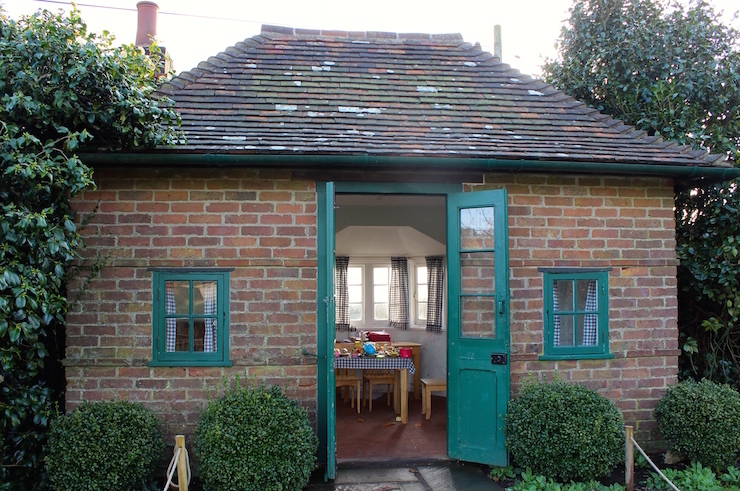 At the back of the walled garden is a little brick play cottage which Churchill built for his daughter Mary. It’s called the Marycot and when interviewed as an adult Mary remembered it having blue check curtains and a chandelier and a working mini Aga where she made drop scones for Charlie Chaplin and Albert Einstein who were guests at Chartwell! Today the play house still has blue check curtains and play food and crockery but no chandelier or working Aga. It’s a lovely, welcoming place for children to play and it’s amazing to think of Churchill and his children there. At Chartwell Churchill was very fond of his pet ginger cat, Jock. When the house passed to the National Trust after Churchill’s death the Churchill family requested that there should always be a ginger cat with a white bib and white socks called Jock living there. Accordingly a rescue cat, Jock VI, is now in residence. You may be able to spot him if you visit. Between the lakes and the woodland there are six beautifully-sited tree swings which are fun to play on. Beyond the swings is an extensive woodland area. There are paths through the woods to lead you to the various points of interest. In the middle of the woods is a crater left by a bomb which fell here during WWII. Chartwell may have been the target of the bomb or it may have been intended for nearby Biggin Hill airport which was an RAF base. The crater is now home to a climbing net and a swing watched over by seats carved from tree trunks. In another part of the woods is the Canadian Camp. Canadian soldiers were stationed here during WWII in order to guard Chartwell. One of their tasks was to camouflage the lakes and swimming pool with brushwood so that they couldn’t be identified from the air. The recreated Canadian Camp today has hammocks and a campfire and is great for kids to play in. Entrance to Chartwell is free for National Trust members. For non-members it costs £6.50 per adult, £3.25 per child to visit the Chartwell garden. The house is closed until February 28th 2015 but it costs £13.00 per adult, £6.50 per child to visit the house and gardens. 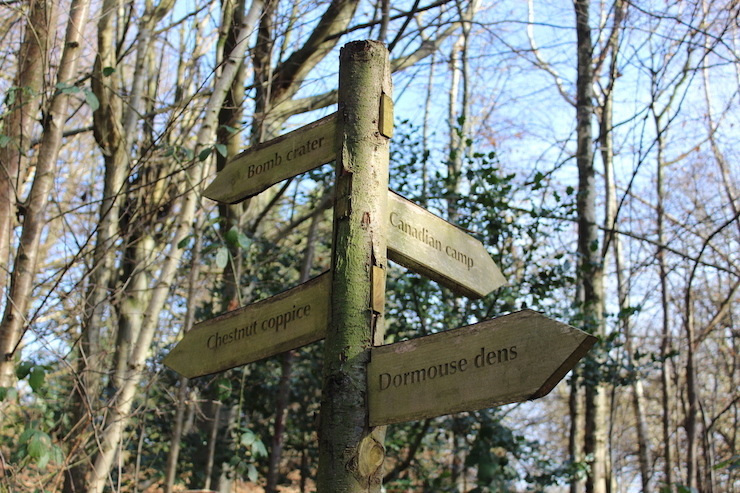 Access to the woodland area is free. The car park costs £3 for a day. There’s a National Trust cafe and gift shop outside the main entrance to the gardens and there’s also a picnic area. The nearest town to Chartwell is Westerham and it’s worth stopping off there if you have time. 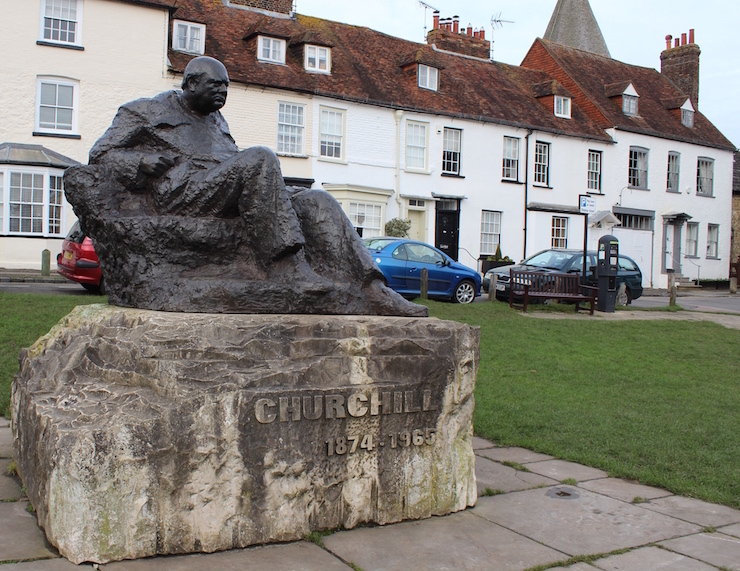 There’s a statue of Churchill on the green and there are some lovely independent shops and cafes to explore. Westerham is mentioned in the Domesday book and St. Mary’s Church at the corner of the green is more than 800 years old. There are various other UK museums and exhibitions relating to Churchill. The Cabinet War Rooms were the British government’s secret, underground headquarters in London during WWII. Together with a museum dedicated to Churchill the War Rooms are now open to the public and are run by the Imperial War Museum. There are children’s and adult’s audio guides available and you can see how the staff here worked and lived underground. Churchill was born at Blenheim Palace in Oxfordshire and is buried in a nearby churchyard. Blenheim is a UNESCO World Heritage site and you can visit the palace and its grounds. Have you been to Chartwell, or do you think that you’d like to go there? Let me know if you have any questions about it. This is very close to us and has been on my list for a while, I didn’t realise it was so family friendly and I LOVE the ginger cat story. Interesting post. I like discovering new historical properties and visiting and revisiting over the years.Marks the passing of time! Have been to Blenheim a couple of times but not Chartwell. The playhouse looks wonderful. Trish – Mum’s Gone To recently posted…Oh What a Night…or two. Lovely to read more about Chartwell and Winston Churchill. This isn’t far from us and we love it here. Chartwell was on my places to visit! (with my brand new National Trust family membership that after years of dithering I finally just bought). I will move it up the list now that I’ve seen how family friendly it is!